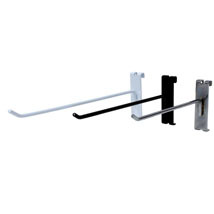 The White Peg Hooks for 3 in. grid are available in 2, 4, 6, 8, 10 and 12 inches long. Peg Hooks will work on the 3 in. on center grid panel. Peg hook thickness is .236 in.